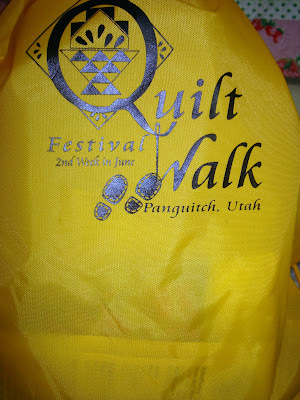 Panguitch Quilt walk was a great event last week and I was very happy to be a small part of it. 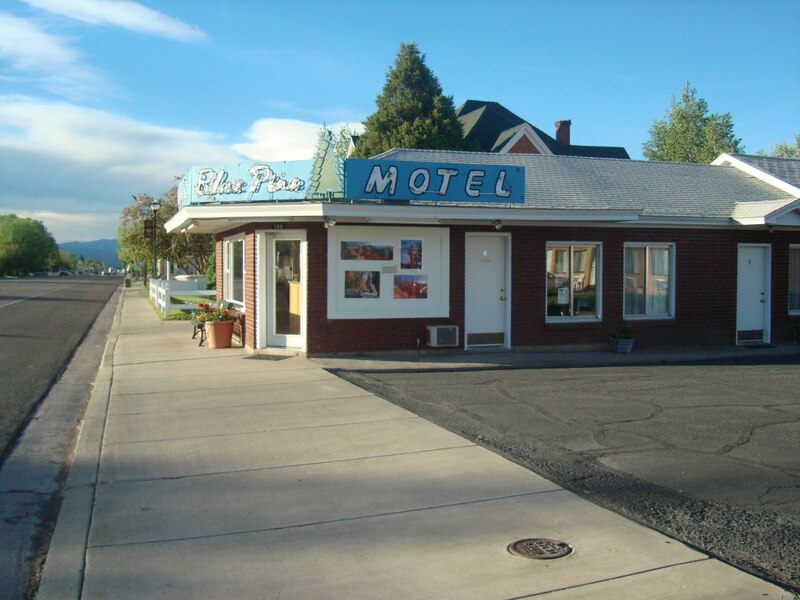 Panguitch is such a sweet little town and the retreat is just part of the community festivities. The organizing gals gave everyone this great little back/pack goodie bag, which I'm definitely going to keep and use again. See Claudia pictured in the middle of my classroom. Claudia is friendly and sweet and made me feel so welcome and valued as a teacher. I had a huge issue as soon as I started to unpack in my classroom supplies. I had left my bolt of interfacing!!! sitting in the living room. I panicked. But Claudia and staff to the rescue. They found one of the merchants to bring me interfacing and saved the day. What could have ruined my class was only a moment of terror for me. And right away the gals took care of me. Next to Claudia sitting at the desk is Jan Marie. 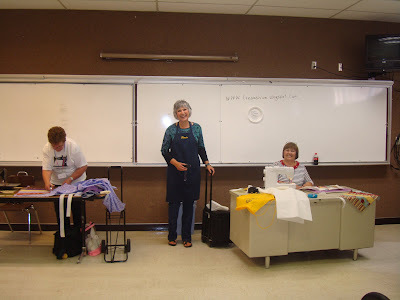 Jan Marie has made a blog of all the fun things that happen during the retreat. 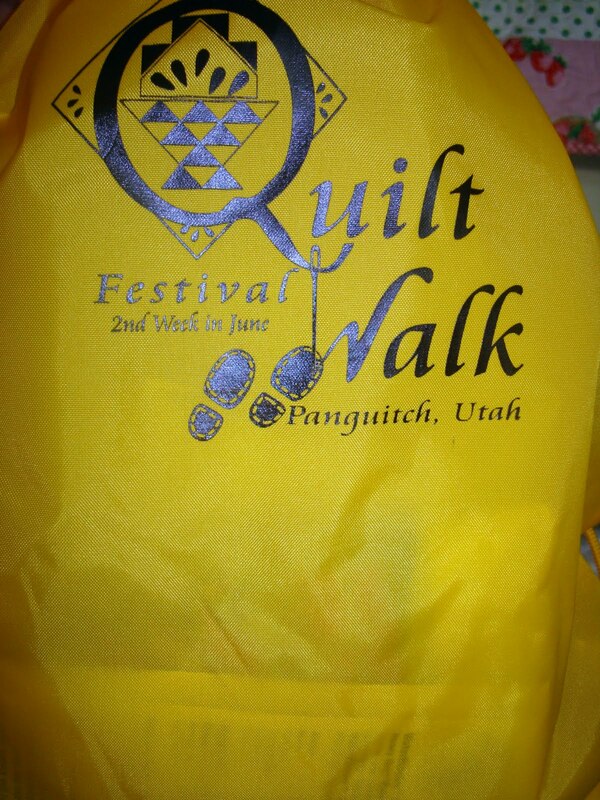 It is Quilt Walk Talk, go check it out. Next year you might want to join us! The quilts here are so fabulous. This is all the fun stuff inside my goodie bag. 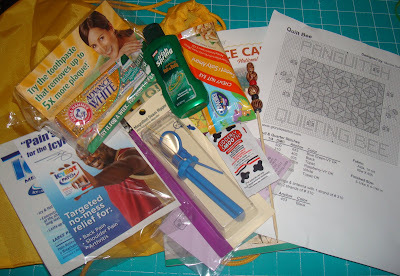 It was unbelievable to me that the bag contained a seam ripper. My seam ripper was virtually useless from use. It is dull (I've gotta find a way to sharpen it). So this new seam ripper was perfect. 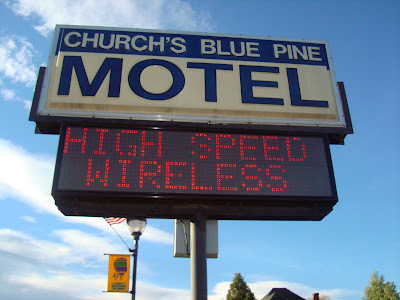 I stayed in a sweet old fashioned motel on the main drag. The funniest thing is they still made reservations in a book. It was like stepping back a bit in time. The room was clean and had a fridge, flat TV and internet. Perfect! Panguitch has less than 2000 people. And I believe they told me the graduating class in high school was around 36 or 38. All the classes are held in the high school rooms with lots of desk space and plugs. Here are my gals busy at work making their "Mixed Bags to Quilt" from my pattern. I can't say enough about how great all the women were that I met in my class - such appreciative students. 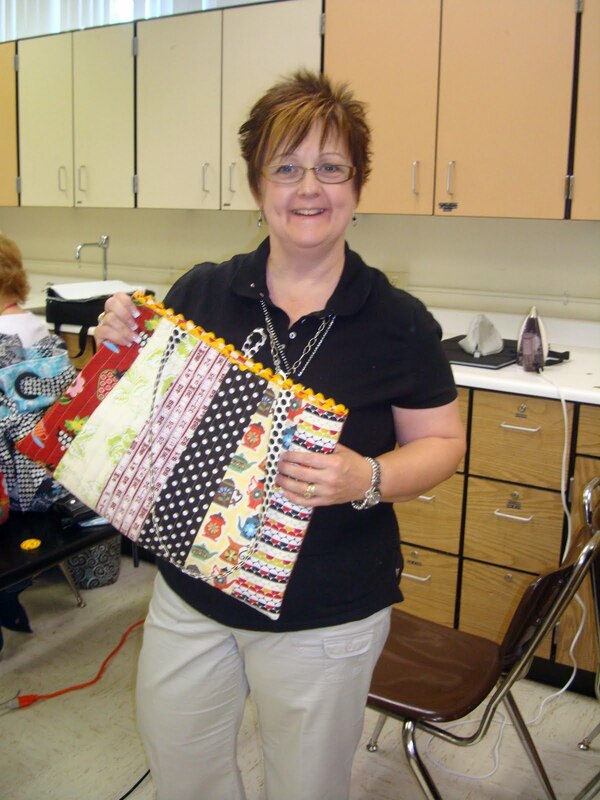 And they all did such a great job on their bags. My prize student, Shannon, teaches bag making at Corn Wagon, a local shop. 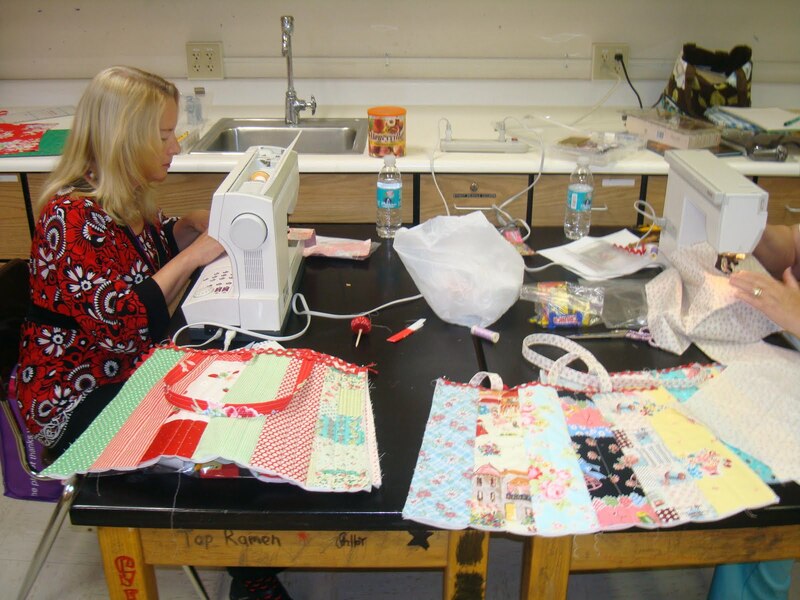 Shannon purchased a kit from me a while back so she brought her kit to class and she finished making her bag first, not that it was a race. Shannon has a cute blog. You've got to go over and say hi. It is really cute just like her and all the fun things that she makes. She even had a gift for me at the end of class!! 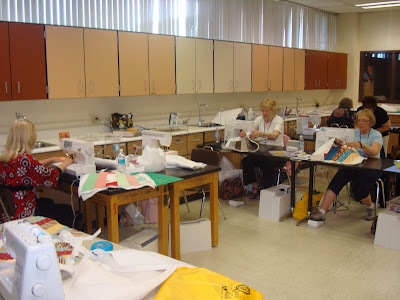 It is really fun to see the bags coming together during the class. Some of the girls purchased kits from me. And some brought their own kits they made from their stash. 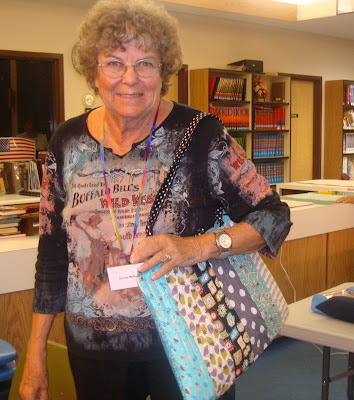 Each gal did a really nice job with their bag. My goal was that everyone would finish a bag. Not everyone was able to finish but most everyone got really far. I took my son, Mason with me to help tote and run. He discovered the streets of Panguitch on his skate board and ran coke and lunch runs for some of the ladies in the class. 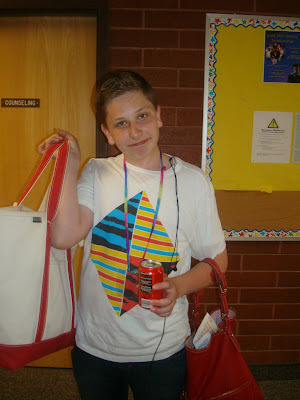 Poor guy, he had to tote my purse and bags around but he's a good sport. Some of the women were able to move into the "free sew" room to finish their bags after lunch. I stayed with a few of them to help and I'm so glad I did. It was a joy to get to know the ladies as they finished up. These girls come every year and are sister-in-laws. They are so cute. I even found that one of the sweet women, Sandra, is related to my brother-in-law. 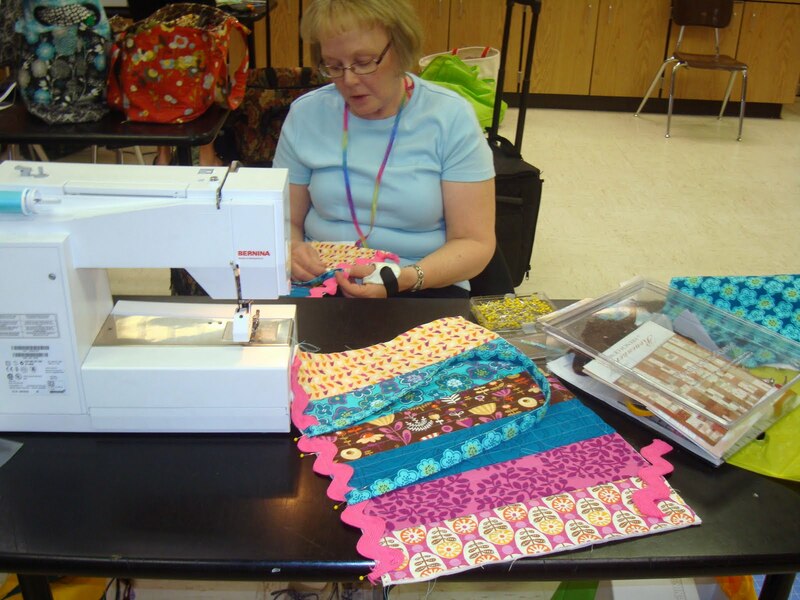 It is a small world, especially among quilters. Thanks to all the girls in my class. 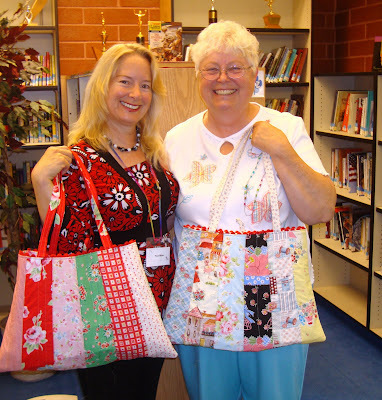 I so enjoyed getting to know them and I hope they all had fun making the bags. Tomorrow I'll show you a few of the quilts I photographed that were hanging in the show. That is if my internet connection is fixed. I just love retreats! And their bags are so cute!! Thanks for sharing your talents with us. I had a great time in your class. I went right back to the trailer and emptied my other bag so I could use my new bag the rest of the weekend. I am starting my second one today. That was a fun class but then aren't all classes fun. I hope to take a class from you again sometime. Wow, for such a small town they really put on a large show. It looks like you were really having fun, lucky girls that had you for a teacher! I love your Mixed Bag, and have made it several times. It turns out so cute with every fabric. 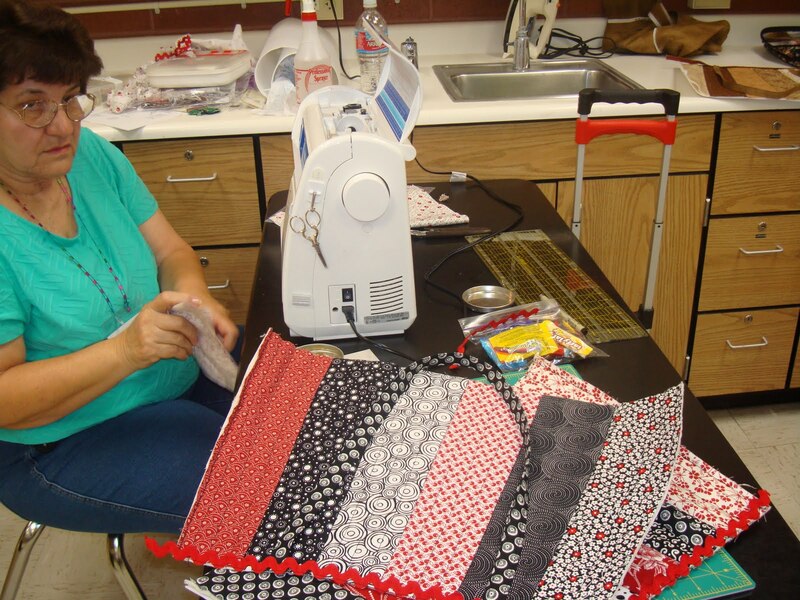 I heard all the positive comments from your class members, and they loved making it, too! You are a wonderful teacher! Looks like a bunch of happy bag makers. I love quaint and old-fashioned. Wish doctor's offices still made appointments with pen and paper. 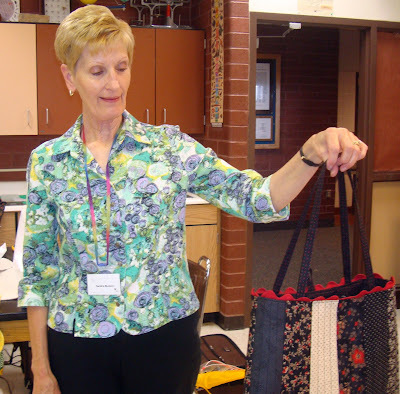 I loved seeing all of the different bags nanette. That pattern of yours is a real winner...i never get tired of seeing all of them in different ways. i also loved the pic of mason...what a sport! What a great experience. Sounds like everyone had fun. That enourmous rickrack one lady had is great! Mason is a gem, helping out ol' mom. Nanette, seam rippers are your necessary tools, BUY A NEW ONE every year for $5, OK? Sheesh. All the ladies look very happy with their bags! It looks like everyone had a lot of fun. Even your son is smiling! The bags are super-cute! 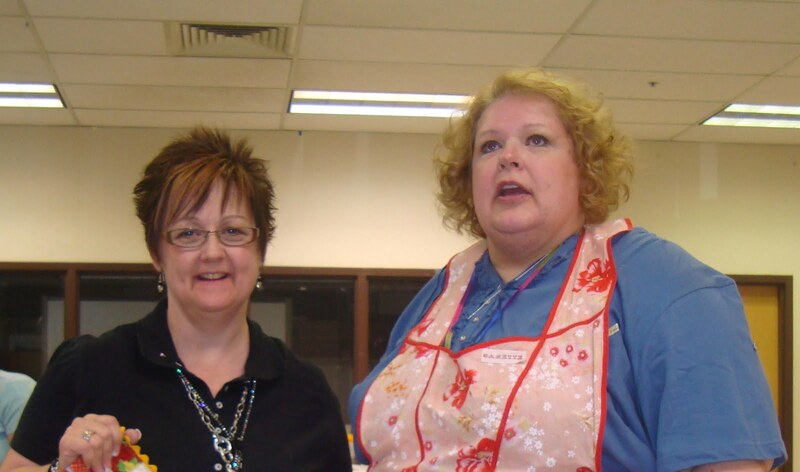 Lots of smiles sure indicates a positive review from your students, Nanette. How could they not love those bags. And you're right, Mason is a good sport. 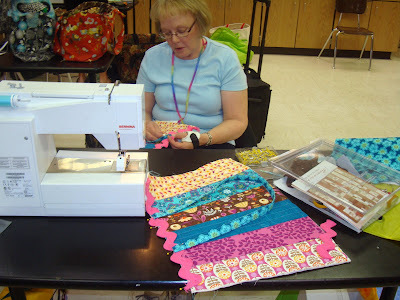 I just love to see so many fabulous versions from one pattern!!! All of them absolutely GAWJUS!!!!!!!! What a wonderful SAVE those ladies did for you. Isn't it great to have things fall into place so well! 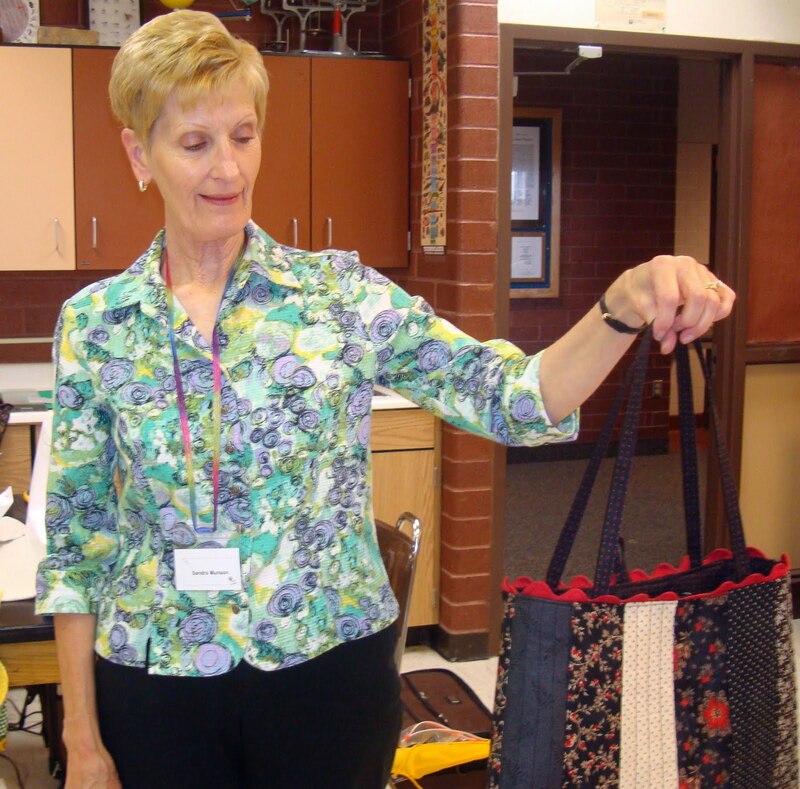 I'm really liking how those pupils of yours put together their fabrics to make their bags. Looks like it was a great group and I am sure they all loved YOU. I love that small town environment! It seems that taking care of you was very important...we just don't get a whole lot of that service anymore here in the big city. Your bags are very pretty! 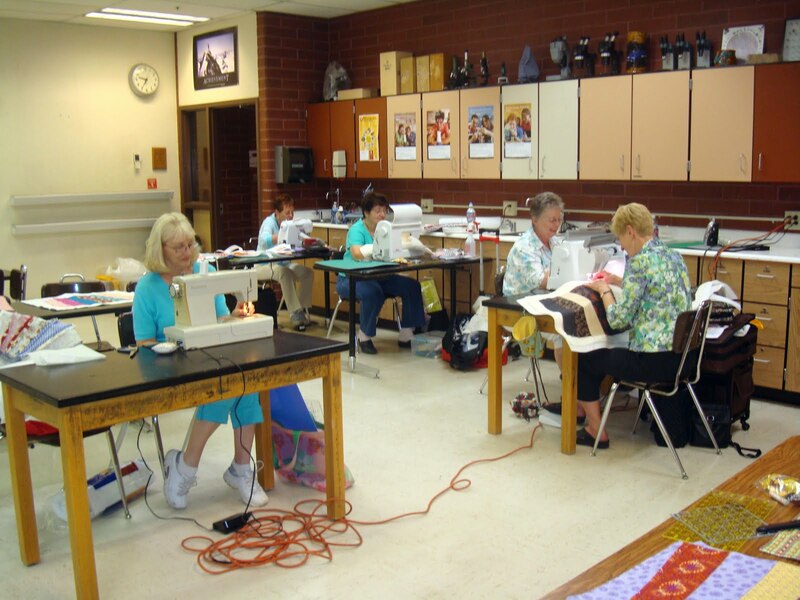 Looks like a great class and I applaud you for helping most of the participants get finished. it's not often you get to walk away with a finished product so i am sure thy were all happy. I would have loved to have been in your class, the bags all look so fabulous no matter what fabrics are used. gotta make me one of those bags. It looks like you had a wonderful time Nanette! How fun to see your pattern being adored by so many women. And Mason looks too fun -- someday some woman is going to love you dearly for training him properly LOL! Oh, I would have loved to have been there - looks like a great time!! Small towns are wonderful!